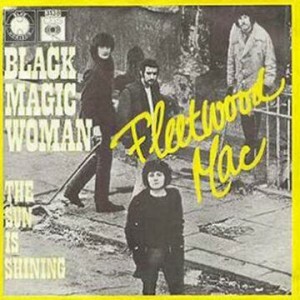 Following the release of their debut album in February, Fleetwood Mac returned to the studio to cut their first original composition single, Peter Green's timeless 'Black Magic Woman.' 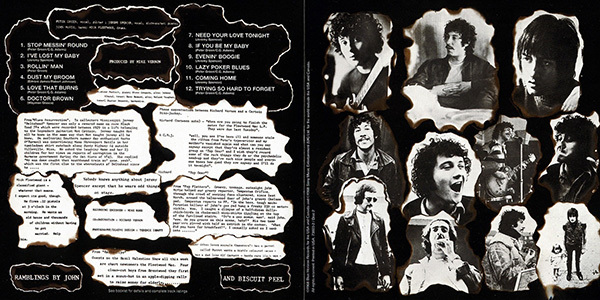 Though it only made it to 37 in the Pop Charts, it was given another lease of life by Rock Band Santana, and the song is still being played today by Blues and Rock bands throughout the UK, and still being requested by their audiences. A month later they were back in the studio again, to record their follow-up single - the equally amaranthine 'Need Your Love So Bad' – and to cut their second Long Player. A totally different approach was taken in the recording, and in spite of Greenie's antipathy for working with Brass in the Bluesbreakers, he found himself using a four-man horn section on 'Mr. Wonderful.' "The plan," said producer Mike Vernon, "was to aim for a dirtier, gutsier sound - closer to that generated at a club performance." To that end, they brought a PA system into the studio and recorded the vocals from that. According to former bassist Bob Brunning "they also recorded the saxes through an old Vox amplifier," though Mac ex-roadie Huw Pryce remembers it differently: "Jeremy suggested playing through the PA to get a live blues sound in the studio,” he said. “Peter's vocals were deliberately distorted by being put through a Vox AC30 amp." Mick Fleetwood flippantly commented, “It was recorded in four days, and it sounds like it!” But no matter whose brainchild it was, or how it was achieved, the sound is deliberately distressed, echoing the ambience of many of the classic 50's Chicago recordings from labels like Chess and Cobra. Stablemates Chicken Shack's Christine Perfect, who had already become romantically involved with John McVie, was invited to play piano on the sessions, and the divide between Spencer and Green had now noticeably begun to widen. It was already established practice that Jeremy didn't play on any of Peter's tracks, and on this album Peter didn't play on any of Jeremy's either. Spencer also insisted on overdubbing his own rather individualistic keyboard, instead of recording with Christine. Green later said: "I had two parts to play, because Jeremy wasn't going to make the effort to learn my things - to play properly on the piano. I was told he could play properly, but I never saw him do that." Nobody knows anything about Jeremy Spencer except that he wears odd things on stage. Richard (between sobs) - "When are you going to finish the notes for the Fleetwood Mac L.P. They were due last Tuesday". A.C.D.J. "well, you see I've been ill and someone stole the ribbon from Pete's type-writer and my mother's vanished again and what can you say anyway except that they're almost a resident group on 'Top Gear' and I wish they'd record some of the rock things they do or the psychedelic send-up and they're such nice people and everyone knows how good they are anyway and I'll do it to-night". From "Pop Platters" - Groovy, teenage, outasight John McVie helped our groovy reporter, Tempestua Orifice, through the crowd of weeping fans clustered, since last March, around the balsa-wood door of John's groovy Chelsea pad. Tempestua reports to PP. "In the boos, tough mock-Peruvian hallway of John's gas pad hung a freaky 250 cc motor-sickle. Wow. I caught a glimpse of a half-dozen dolly-chick-birds in chain-mail mini-skirts giggling at the top of the fur-lined stairs. 'It's a gas scene, man'. said John. 'wow, do you groove on this scene, baby?' His two tame panthers played with half an ostrich in the corner. 'What did you have for breakfast?' I casually asked as I sank into......"
Mick Fleetwood is a classified giant - whatever that means. I expect it's good. He fires .22 pistols at 3o'clock in the morning. He wants an old house and thousands of children without having to get married. Help him. Trk. 1) Like all of Peter's songs on this album, "Stop Messin' 'Round" is credited to P Green & C G Adams. Adams was Peter's manager, who claimed composing credits "for legal or copyright reasons." Explaining later, Green confessed: "That was Clifford Davis, our manager. He put his name on it, said it was a tax dodge." But when asked 'Did it really save you in taxes?' he replied "I never knew." Given the lengths that Green went to later, to try and renounce all his royalties, I don't suppose it matters that he was being ripped off at the time. All that aside, the song is a warm, relaxed shuffle with a driving rhythm section, rolling piano fills and beautifully phrased guitar solos. A lovely mellow sax section adds extra swing, and the whole sound has a very “retro” feel to it. Oh, and it's catchy, too. Full marks. Trk. 2) "I've Lost My Baby" is Jeremy's first track, a slow Blues of his own composition that's very much in the Elmore James mold, with tinkling piano provided by Spencer himself. The addition of saxophones brings the sound much more in line with James' recordings, and at a cursory listen you could easily mistake it for one of Elmore's own. Clever stuff. Trk. 3) "Rollin' Man" is a cheerful and sprightly rumba extolling Mr Green's virtues under the blanket. Towards the end it turns into a swing shuffle, bringing to mind BB King's 'Woke Up This Morning.' In fact there's a lot about Greenie's tracks on this album that's reminiscent of BB King, and that's no bad thing. Fleetwood provides delightfully fluid drumming, and the band really cooks. Fine work. Trk. 4) Our Jeremy takes Robert Johnson's "Dust My Broom" in (surprise!) the style of Elmore James. This rocks along very nicely, and with Spencer playing his own piano again, it comes very close to capturing the feel of vintage Elmore. Carefully crafted. Trk. 5) "Love That Burns" is a mournful, slow Blues in a minor key, and Green's emotional voice is still deeply affecting, clipped and muddied as it may be by the old valve equipment. Evocative of the style of Otis Rush, with a somewhat understated guitar solo. As Peter said, “Some people think that the Blues is just a way of playing guitar but it isn't. The Blues really is about having the Blues." This track is certain proof that he had them. Trk. 1) "Need Your Love Tonight." At least with vinyl you'd get to catch your breath before Spencer started dusting his broom again, but on CD it's pretty much like leaving the previous track on repeat. Fond as he may have been of "that" guitar riff, Elmore was capable of introducing much more variety than this into his repertoire. A pity, perhaps that they didn't include something different. Both the bonus tracks on the CD version, and the cuts subsequently issued on “The Original Fleetwood Mac” LP show that Spencer did record other songs in different styles, including a couple of solo pieces, any of which would have been better here. Trk. 2) Peter's "If You Be My Baby" is a delightful, very easy-going shuffle which kicks off with singing guitar phrases, to which the brass section replies, like call-and-response. A simple, singable tune with an atmosphere that's beautifully mellow and relaxed, no-one's trying too hard, and it all comes together perfectly. Corking! Trk. 3) "Evenin' Boogie." Jeremy Spencer reprises 'Shake Your Money Maker' without the vocals. No-one's trying very hard at all here, and it shows, though it does provide a change of pace, and boasts the album's only sax solo. CD bonus tracks include Spencer's 'Mystery Boogie' which has a Duane Eddy air about it, and might have made a preferable substitute, but there's no certainty that it was recorded during the same sessions. Trk. 4) "Lazy Poker Blues." “When I'm with my baby, lazy pokin' goin' on?” Tut tut! Behave! Following the formula of Greenie's other cuts here, it's really rather like 'Stop Messin' Round' part two. His weakest offering here, but still good rocking Blues. Trk. 5) With "Coming Home" Jeremy attempts a genuine Elmore James number. This one comes off rather better than the last couple, and at 2.41 it doesn't wear out its welcome either. Again he puts a lot of work into recreating the sounds of the original. Nice. Trk. 6) "Trying So Hard to Forget." An acoustic Blues with lovely harp from the late lamented Duster Bennett. This change of approach is very gratefully received, and once more Greenie proves his voice is the real instrument. I've no doubt that when he was "just a downtrodden kid" he really did have a lot of hurt to forget. Mick Fleetwood recalls, it was "Peter Greenbaum baring his soul about growing up in Whitechapel, London's Jewish ghetto. For almost the first time I could feel the pain, hurt and sense of loss that Peter was expressing through the solace of the blues." An excellent track, and a fine one to close the album. 'Mr Wonderful' charted in the UK, peaking at No. 10, but failed to repeat its predecessor's success. 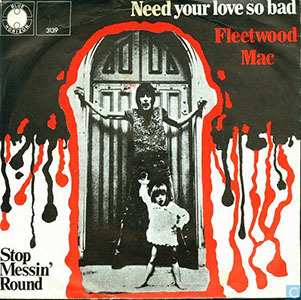 It was the last LP recorded by the four-man Mac line-up, before the addition of Danny Kirwan (although an LP of out-takes, 'The Original Fleetwood Mac,' includes many fine cuts that had remained unreleased when the band split, and is a Classic in its own right.) It also marked Christine Perfect's first step towards becoming a member of Fleetwood Mac, which she remains to this day. She contributes some fine supporting work to the ensemble here, as do saxophonists Steve Gregory, Dave Howard, Johnny Almond and Roland Vaughan. A number of reviewers have been uncharitable to this album, including well-known Richie Unterburger, who complains, “the limits of Jeremy Spencer's potential for creative contribution were badly exposed, as the tracks that featured his songwriting and/or vocals were basic Elmore James covers or derivations.” Well, no change there, then! He also states “Peter Green, the band's major talent at this point, did not deliver original material on the level of the classic singles he would pen for the band in 1969,” but some of those works - “Man Of The World,” “Oh Well” and “The Green Manalishi” - were composed when Peter was approaching a mental meltdown. Green, incidentally, belittled his abilities as a songsmith, telling Guitar Player "Oh, I was never really a songwriter. I was very lucky to get those hits." The 'Sputnik” website contains at least two pans of the LP, although one reviewer can't tell a saxophone from a trumpet, which must be a disadvantage. The other calls it “ a record that is best left forgotten,” claiming “the guitar leads here are repetitive and uninspired, as is the bass,” and that the horn section “merely adds an extra layer of cheese to an already-subpar album.” He then blames Clifford Davis's (non-existent) contribution to the song writing for the weak material, and finishes by saying “This record is an uninspired exercise in blues that is as unappealing as animal feces” (sic.) Which I think is a bit rude. But all the reviews seem to agree on one point. 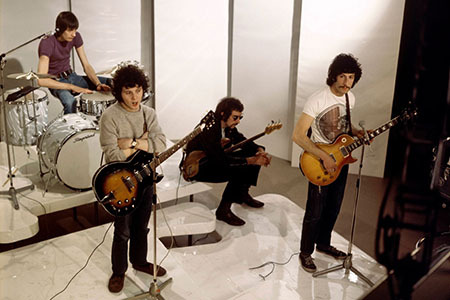 “The Peter Green-led Fleetwood Mac succumbed to blues conventions,” “The band's take on down-and-out blues continues in varying degrees,” and simply “So much of the record was routine blues.” Even The Telegraph's Neil McCormick dismisses it with, “After their raw, rocking debut, the band went straight back into the studio too quickly for an album of clattering blues covers dominated by the unrefined Jeremy Spencer and sabotaged by an out of key horn section.” Well, if your major complaint is that it's a Blues LP, you're rather missing the point! 'Mr Wonderful' is very much what it was meant to be, as Mick Fleetwood described it, “Ragged low-down blues by the seat of the pants.” And though Mick may have believed “Fleetwood Mac never wanted to be pure blues like John Mayall,” - if indeed you consider Mayall's Blues “pure” at all - Peter Green was of a decidedly different mind, saying "There were a million groups making a mockery of the Blues. And a million guitarists playing as fast as they could and calling it Blues. I didn't want the music messed about." What the band delivers on this album is just that – Blues that hasn't been messed about with. Live, one-take, warm, swinging, feel-good, big band Blues, nothing fancy, just getting as close to the feel of the classic Chicago recordings as British-born Bluesos can. Now, that's Wonderful! And enough to guarantee it a place among the Classic Albums of British Blues.